I’m on my day 80 today, and reading this helped. 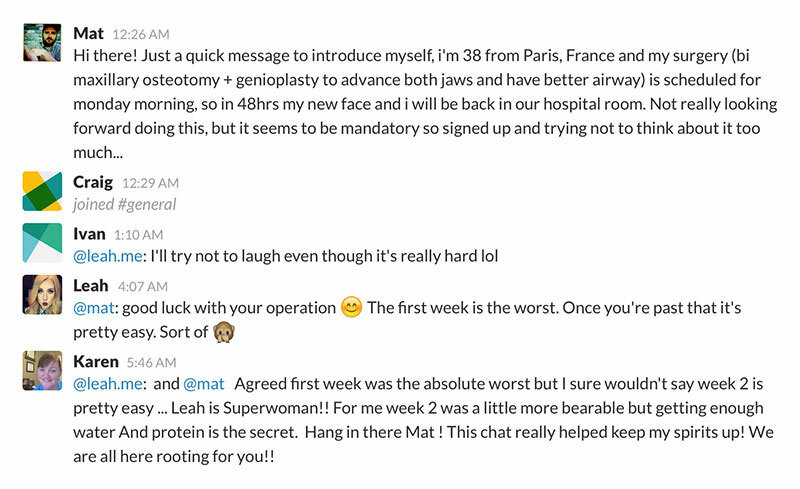 I never in the least had any regretful thoughts about surgery until the past week. I had a dental cleaning and one area of my gums had become swollen, I guess due to the difficulty I’ve been having properly brushing and flossing since surgery. They did some deep cleaning and I was in SO MUCH pain for a good 4-5 days! The entire left side of my face throbbed, ached and burned. It made my head hurt as well. The pain was as bad as after surgery, but I was actually more comfortable back then because of the pain meds I had. Actually, I’ve been in varying levels of pain since surgery, even though my surgeon told me over a month ago that I shouldn’t really have pain any longer. Abby, orthodontic visits will forever leave us with pain and discomfort, won’t they? I’m happy you’ve made it to Day 80 and that you’re back to your orthodontist. You’ll be smiling brace-free soon, my friend! 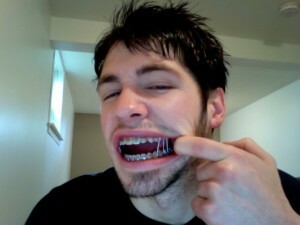 When your wires are cut, you’ll most likely be required to wear elastics all day and night, removing them only to eat. I was on blended food for quite a few weeks following my wires being snipped, so don’t get too excited. Having the wires cut will still be awesome for you, though, because you’ll be able to breathe a little easier (and maybe brush more thoroughly!). Thanks for posting this blog. I am a mom of two young children and being wired shut during the holidays had proved to be much more difficult than I had imagined. I find myself feeling sorry for myself, and pouting when I know I should not. I am getting my wires cut on January 10, 2011 and I am not sure if that means I get tot eat semi blended foods or if it is a continuance of what I have already experienced. I am assuming that I will be cut free but still have rubberbands at night. not sure…I am 35 and a little older so my recovery might take longer. I am just a little discouraged…. I did stop taking the vicodin because it made me crazy and irritable. Congrats with your recovery Graham! Well, my teeth are far more prominent now. They look huge to me, but apparently they’re just normal. Everyone else says I look way different. You may not notice it because you see yourself everyday, so it’s a bit more gradual. But yes, there’s a pretty big difference. I’ll post before and after shots when I get them from my surgeon and we’ll see if we can tell. it did, thank you again. i guess with all surgery’s comes risk and pain..=/ and i guess in order to get through a surgery like this you need some motivation, but hey Aimee you did and now the surgery is but a memory. Graham, is there a BIG difference from your appearance before? Hey Kim, glad I could provide some useful information for you and Jay. I was looking around for recovery tips before I had my surgery, but I couldn’t find much out there, so I decided that I’d create a resource for others to take advantage of. I wasn’t sure if it would actually be useful or not, but it seems like a few people have found it helpful, and that’s enough for me. Just make sure Jay gets outside as soon as he can. Sitting around and wishing you *could* be doing things is a surefire way to make every day go on forever. Hi Graham, I am Jay’s Mom, I have to say that reading your blog is very entertaining! You have a wonderful sense of humor which I am sure has made your recovery a little easier. Jay told me about your site and while I haven’t read all of it yet, it has been helpful to learn what to expect, for both Jay and me. I will be going out to buy a few bibs and baby items – spoons and toothbrushes! I never would have thought of those things, even with all the surgery Jay has had! Thank you for all of your words of wisdom and for sharing your experience. I am encouraging Jay to do the same thing, I think it will help him with his recovery too. Best of luck to you and again, thanks!! Hey NyCgirl, it was all done at once, as I’m sure yours will be too. They didn’t ask beforehand, but it’s not a separate surgery. They don’t just go ahead and give you a nose job as a freebie. What happens is when they move your top jaw around, it distorts your septum, so your nose often ends up crooked or pushed up (because your face changes shape). So they’re really just attempting to put it back the way it was before your jaw was moved around. Good luck, Rob! Please keep us posted on your progress! I’m whistling more and more…and not having to blow hard. Wow, this is pretty amazing. Thanks, Disc…what a great idea! I wish you all the best Rob. I still can’t believe how many people out there are in a situation similar to mine. Just got of the hospital today after they fixed my maxillary hypoplasia. Thanks for you this blog. It is huge! I haven’t had much movement till now because of the splint but I have tried to move my lips as much as possible for some time. Now that the splint is off, I’ve been working it like crazy since yesterday! I’ve been doing this since sometime near the beginning – when I was able to move my mouth. So, it’s hard to say how quickly it works because I just have always done it. But I’ve had enough surgeries to know that scar tissue “pulls” and that to keep it somewhat “soft” you have to work on stretching it.